MyHosting VPS services are extremely unique in that they offer the user full customization of their Virtual Private Server. Whether you need a Windows VPS or a Linux VPS, you’ll have complete control over the hardware your VPS has, from disk space to bandwidth, you pay for exactly what you need. MyHosting is one of a very few top rated companies that operates in the virtual private servers (VPS) industry. Today, there are almost an endless number of hosting companies that supply this type of service that you can choose from. However, only a tiny fraction of them provide the comprehensive package that a webmaster must have in order to accomplish what they need. If you are not familiar with virtual private servers, they are an upgrade when compared to shared web hosting packages, but are not quite as powerful, or expensive, as dedicated servers. You’ll need a VPS if your site is receiving a heavy load of traffic, need faster page load times or overall better performance to handle multiple websites. Sign up to MyHosting through TopFiveAdvisor and save instantly with our coupon. Code and sign up link available after clicking here to order. Below you will find our full review of the MyHosting VPS hosting solution including both Windows and Linux plans as well as features included. MyHosting was awarded the best VPS hosting for the many custom VPS options, their excellent prices (made even better with our exclusive coupon), 100% network uptime SLA, and every customer support option you could ever ask for including 24/7 toll free support and user forums. MyHosting backs up your VPS every 48 hours while their competitors offer nightly. However, since this is a VPS, you can configure your own full offsite backups if needed. Virtual private servers perform as if they were individual servers. The server is partitioned in such a way that each client has total control over their section of the server. A user can install their own operating system, reboot the computer whenever they wish, and protect their server using any firewall or software that they desire. Or, take all the complication out of the picture and let the host manage your VPS with the specs you need so that you can enjoy the performance boost over typical shared hosting solutions. MyHosting Shared Hosting – The most common hosting they offer, based on Linux and is the cheapest hosting solution they provide. MyHosting Windows Hosting – Need ASP.NET or MS SQL databases? You’ll need Windows hosting. Our review for their Windows based service is available on this page. Now that we’ve knocking shared hosting out of the way and you are truly here for their VPS features, let’s further drill down which VPS plan you actually need. Note: Below is responsive, if they are “stacked” instead of let/right orientated, you may need to widen your browser window or change orientation on mobile. cPanel or Plesk control panels available. Unlimited hosted domains included on cPanel. Pricing more than double Linux. Only Plesk control panel is available. Windows 2012 R2 or standard versions available. Upgrade to Plesk 100 domains or unlim is extra. From their custom VPS builder, you will notice 4 different pre-built plans to choose from whether you go with Linux or Windows. These plans are the Barebone VPS, Developer VPS, Business VPS and the Reseller VPS. See our pricing section below for exact comparisons between all 4 plans and pricing between Windows and Linux as well, it will give you a better idea of what you’ll really pay depending on your configuration needs. The Barebone and Developer VPS plans are for advanced users only and definitely not recommended for people expecting a interface to configure your VPS settings. With these plans, you’ll be working strictly in shell to make your configuration changes and they are typically for developers who simply need a VPS to test their code on, a VPS to build on or for advanced users who know their way around black screens and system configurations. Business VPS – This is the first pre-build that includes easy management through either cPanel or Plesk. A bit more expensive but necessary for those unfamiliar with servers or for those that want simplicity. Reseller VPS – You only need this if you want to resell space on your VPS with clients or if you are a madman that wants to host hundreds of your own websites. Even then, you’ll likely save money by using the “Barebone VPS” setting and customizing from there to include the control panel and specifications you need. The starting price is a little deceiving, because the more options you add, like additional hard-drive space, more bandwidth, or the ability to host an unlimited number of domain names, can send your cost far higher. However, again, this custom VPS builder is why MyHosting received our DIAMOND AWARD in the first place. The virtual private servers company MyHosting basic plan at $11.96 a month is an unbelievable value. Their build your own server is a great deal for somebody that knows what they are doing. Be sure to check out the coupon from above and start your purchasing from that link to save over prices shown on your order. 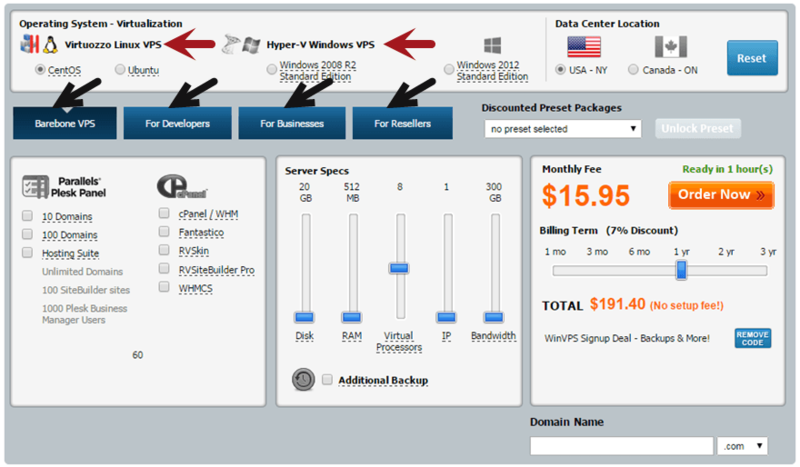 Below is a quick feature comparison using their pre-built packages in their VPS customizer. Pricing below assumes 1 year prepay is left and does not include the discounted offer at the top of the page. Changing the prepay obviously changes the monthly overall price you will pay either less or more depending your preference. Reseller VPS – Unlim domain cPanel, Fantastico, WHMCS, 40GB space, 1GB RAM, 11 virtual processors, 2 IPs and 600GB transfer: $55.75. T5A VPS Option 1 – Unlim domain cPanel, 40GB space, 1GB RAM, 8 virtual processors, 1 IP and 600GB transfer: $29.48. T5A VPS Option 2 – Unlim domain cPanel, 80GB space, 4GB RAM, 12 virtual processors, 2 IPs and 1,200GB transfer: $56.92. Reseller VPS – Unlim domain Plesk, 60GB space, 1GB RAM, 2 virtual processors, 2 IPs and 600GB transfer: $45.95. T5A VPS Option 1 – Unlim domain Plesk, 40GB space, 1GB RAM, 1 virtual processor, 1 IP and 600GB transfer: $46.81. T5A VPS Option 2 – Unlim domain Plesk, 80GB space, 4GB RAM, 2 virtual processors, 2 IPs and 1,200GB transfer: $72.39. * Pricing is accurate at the time of writing this review. If you notice a difference, please leave a review below and let us know so we can revise accordingly. Thank you. The effort that MyHosting has put into their customer support is absolutely amazing and offers some the most expansive and impressive help we’ve seen for VPS customers. If you start at the main help page (found in the header “SUPPORT” link or in the footer “Community & Help) and click the VPS Hosting button, you’ll be presented with an option of cPanel, Plesk or no control panel to drive you to the right section for your control panel selection. No matter what you select, you are going to find a full knowledge base, starter guides and a video guides section to choose from. All sections include a search to help you find the topic you need help with. The only negative we found is the “No Control Panel” section is limited to the knowledge base and starter guides, neither the Windows or Linux section has video guides to help you. However, since most users will use Plesk or cPanel, there’s no problem with that since Barebones configurations are for advanced users anyway. What if you can’t find a solution in the self help? They have you covered. Community Forums – This forum is very active with posts the day of this review (you’d be surprised how many forums we’ve found with weeks-old posts as the newest). You’ll want to find the “Virtual Server” section of the forum to get help with your VPS questions and to help others. Wiki – This area is an extended knowledge base found in the footer of their site. 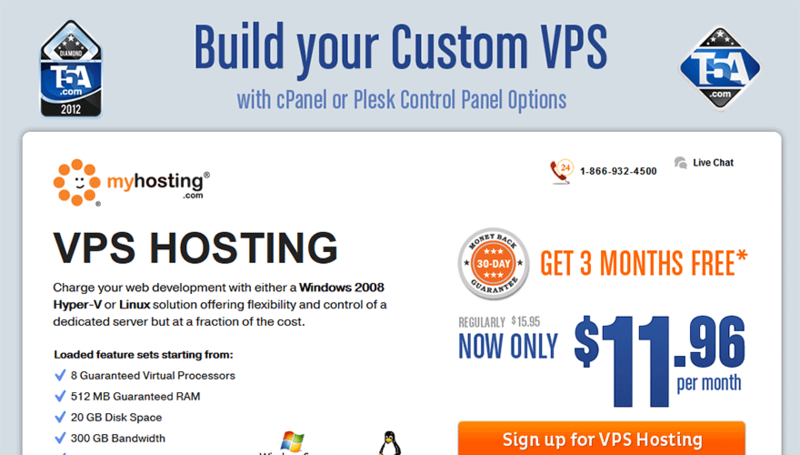 You’ll want to find the “VPS Hosting” section and review the topics there. Don’t be confused with the “17” number, that’s just for that particular main section of the Wiki, look for sub-categories in there that have hundreds of topics to browse and learn from. Awesome. Status Blog – Here you are going to find out about script exploits discovered, emergency maintenance and other things that may be causing you service interruption. Definitely bookmark this if you decide to sign up. Live Chat – Again, this feature received top marks because they offer both sales support and technical support for VPS customers. Usually, we find that live chat is strictly meant for sales support to get you signed up, not with MyHosting. Email Support – Here you can request a call-back or submit your questions into a customer support form that submits your question into their customer help ticket system. You can choose “VPS Support” here to have your question sent directly to specialists in that department. Phone Support – They offer toll-free telephone numbers in a whopping 8 countries including: USA, Canada, Mexico, UK, Australia, Germany, South Africa and Turkey. They also promise your phone support is going to be available 24/7 in English with response times within 60 seconds. Again, awesome. MyHosting also backs their VPS plans with a 100% uptime guarantee. According to their SLA policy, you will receive a 1% credit on your total hosting fees for every 1% of downtime experienced. As always, the maximum credit is equivalent to and will not exceed your monthly fees. The Support Negatives: Do not consider using their social media accounts for questions or support. They strictly use these avenues for advertising and news about their services which can be easily discovered in their status blog we’ve reviewed above. I looked back 2 weeks and couldn’t find a single customer question replied to or answered on either Twitter or Facebook. They use Dell PowerEdge servers on Cisco network equipment that is on fully backed up fault tolerant RAID arrays with protection by enterprise firewall and intrusion prevention appliances. Their infrastructure is powered by Level 3 and other premium redundant data networks. During your build of the VPS of your dreams, you’ll also be able to select your data center location. The USA – NY selection is default but you may choose to have your site hosted in Ontario Canada as well. We hope this MyHosting VPS review summary answers most of your questions. As always, we rely on actual MyHosting customers to let us know how their service has been. How has their customer service department treated your requests? How fast do they reply? How has phone support been? How has your VPS performed? How fast did their technicians fix your issue(s)? Leave your rating below to let everyone know how everything is for you this month (in this industry, things change fast).